Hollywood Squares – A Muse Style! We’ve chosen one of our Crew to hold a secret prize. Who do you think has the prize? If you guess the correct A Muse Crew member, you move on to the next round of the game. For round two, we’ll mix things up, add a new prize, and you’ll get to guess again. We’ll keep going until we have one winner who will then receive all the prizes revealed in each round of the game!! You must be registered at www.amuseapalooza.com to play. To enter, leave a comment on this post with your guess (one entry per person) before this round of the game ends at midnight Pacific time Monday June 4th. Then check back on Tuesday to see if you move on to round two! While you’re here, grab your stamps and make a card for our “Seeing Scenes” design challenge below! Good Luck! Let's see your scenes! A Muse images work so well together that creating scenes is simple and fun! So your challenge this week is to create a scene card. You may use your choice of ink, papers, colors, stamps (please use at least one A Muse stamp if possible), embellishments, etc. Leave a comment on this post (one comment per card) and include a blog or gallery page link to a photo of your new original creation by midnight Pacific time Sunday, June 3rd. (Cards must be new creations not previously posted or submitted to any A Muse contest.) Then we'll draw a random winner on Monday! · And an assortment of Strano ribbons! You may submit more than one entry for this challenge - the more you create, the more chances you have to win! Click here to see a sample by designer Emily Montenaro to get you thinking! Don't have a blog or online gallery? Leave a link to your card photo from your online photo album (such as Kodak EasyShare, Snapfish, Flickr, etc). Or see our links at the end of challenge 1 to setup a Splitcoaststampers gallery. Can't wait to see your scenes! Thank-you to everyone who "got punchy" for Challenge 4! We hope you are enjoying our weekly challenges! We are thrilled with all the fabulous creations! This week you created 204 cards!!!! Make sure to check them out! 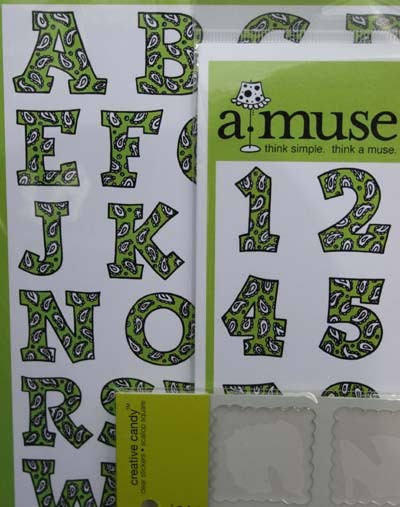 · A Muse Paisley Alphabet and Paisley Numbers clear stamp sets!! Congratulations Sarah! Send an email to amuseapalooza@comcast.net with your address and we'll send your goodies! We posted some random weekly winners today too - see posts below! And now, the random winners for week 4 selected from www.amuseapalooza.com registrations! 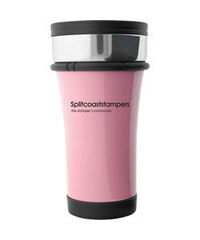 Prize 2: Splitcoaststampers prize package including: mug in your choice of color and one year subscription to SCS Fan Club. Theresa and Jennifer, we sent you an email so please send your addresses to amuseapalooza@comcast.net and we'll mail out your goodies! Challenge 4 winner is up next! Swirly cake stamp (new! ), package of Limited Edition Popsicle Pink Bold Asterix notes, and Mini Star Twinkle Stickers to celebrate our 6th birthday!! 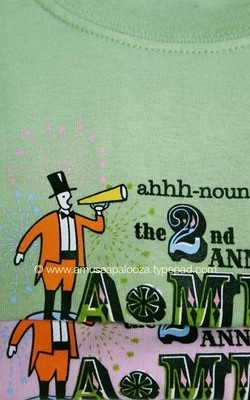 Tisha, send an email with your address to amuseapalooza@comcast.net and we'll send your goodies! Weekly registration winners are up next! There is still time to "get punchy" for challenge 4 - see below for details! Our next featured store is Scatter Joy. 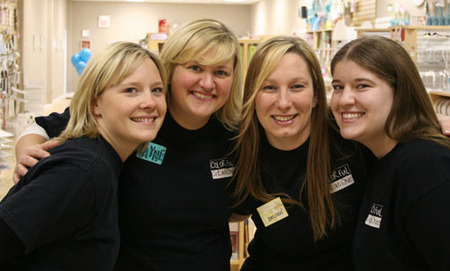 Scatter Joy in Sioux Falls, SD has been in business for 2 ½ years. The store is a little over 3000 sq ft and is located in a strip mall. Owner, Sandy Christians, has created a homey store where customers feel like they are just going over to a friend’s house. She has 1 full time and 9 part time employees. With Paper-crafting as a hobby, Sandy saw a need for a stamping and scrapbooking store in Sioux Falls and as a business person, decided to open her store to provide the kinds of things she wanted to use in paper crafting. The store carries a large inventory of anything needed for stamping and scrapping. Sandy’s favorite A Muse stamp right now is the Park bench, but she has LOTS of other favorites, too! When we asked her what’s the best thing about the customers that shop in her store, her reply was LOYAL FRIENDS! Edited 5/24/07: Hope you enjoyed the first sneak peek of our Fall stamps! This sneak peek was only available for a Limited Time, but we will be sharing more in the coming weeks so stay tuned! There is still time to participate in our Punch challenge - see below for details! Did you see this post last week? How Many Stamps - Answer and Winner! So how many stamps were in Jennifer's Suitcase? The answer.....956! The winner is........PAM BECKER !!! with her guess of 957 ! We said we'd roll the prize over to the next game if no one had the correct answer, but ONE away out of about 1200 entries was just tooo close not to award her the prize! Congratulations Pam - we sent you an email so please send your address to amuseapalooza@comcast.net and we'll send your gift certificate! Special thanks goes out to Jennifer Pebbles for the awesome suitcase photo! Poor Jen - it took her over 5 hours to put all her stamps back! Thanks Jen! We posted Challenge 4 today so make sure to check it out below! Challenge 4 - Get Punchy! Get out your punches, this week your design challenge is to use them! There are so many ways to use punches so feel free to be creative! Please use at least one punched shape in your design. You may use your choice of ink, papers, colors, stamps (please use at least one A Muse stamp if possible), embellishments, etc. Leave a comment on this post (one comment per card) and include a blog or gallery page link to a photo of your new original creation by midnight Pacific time Sunday, May 27th. (Cards must be new creations not previously posted or submitted to any A Muse contest.) Then we'll draw a random winner on Monday! This week the prize is a SURPRISE!! Click here to see a sample by designer Julie Ebersole to get you thinking! Looking forward to seeing your fun and creative uses of your punches! It's time to announce winners for week three of our A-MUSE-A-PALOOZA 2007 countdown! Winners were randomly selected from www.amuseapalooza.com registrations. *Stamps and ribbon vary per prize package - stamps shown are representative. 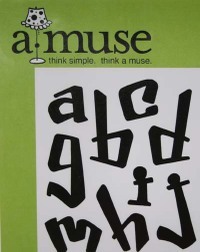 Prize 2 – A-MUSE-A-PALOOZA T-shirt. We will send either pink, green or grey at our discretion in your choice of size: L, XL or XXL. Sandy and Elaine - we sent you an email so please send your addresses to amuseapalooza@comcast.net and we'll mail out your goodies! Thank-you to everyone who participated in our sketch challenge! Topping the total on the last challenge, this week you created 144 cards - AMAZING! Make sure to check them out! Adelina, please send an email to us at amuseapalooza@comcast.net with your address and we'll get your goodies in the mail! It's time to announce the winners for week one and week two of our countdown to A-MUSE-A-PALOOZA 2007! Winners were randomly selected from www.amuseapalooza.com registrations. *Stamps and ribbon vary per prize package – stamps shown are representative. Shellie, Amy, Shelly, and Erin - we sent you an email so please send your addresses to amuseapalooza@comcast.net and we'll mail out your goodies! Winners for week three will be announced on Monday! Don't miss our "How many stamps" game and sketch challenge - see details below! There is still plenty of time to enter your guess for our "how many stamps?" game and to participate in the sketch challenge - see posts below for details! Our next featured store is Rubber Stamp Fantasy in Marietta, Georgia. 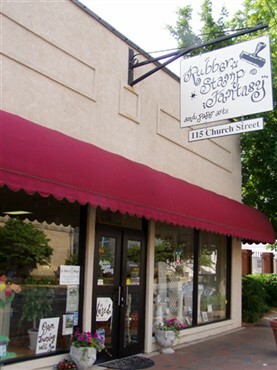 Rubber Stamp Fantasy has been in business for 12 years and is located on the historic downtown square in Marietta, GA. The store has a welcoming décor with over 3000 square feet of space, including a loft classroom, which can accommodate lots of people. Debbie started the business as a gift shop in 1984, selling hand painted personalized gifts. Gary joined her in 1990 and they expanded the items they were selling to include stamps. The stamp side of the business grew and grew, so they decided to close the gift shop in 1994 and open Rubber Stamp Fantasy. They even had to move from their initial space to a larger one and have been in the new location since 2004. The customers that shop in Rubber Stamp Fantasy quickly become “extended family” to Debbie and Gary. 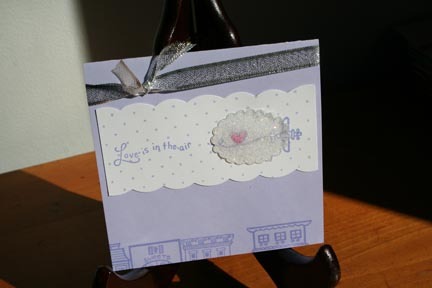 They share a love of stamping and paper crafting and also support each other through life’s ups and downs. For A-MUSE-A-PALOOZA, they plan on card blitz classes throughout the week and make and takes on Sat. July 14th. There will be prizes and refreshments, too. We can't wait to show you our new Fall stamps in July at A-MUSE-A-PALOOZA 2007! Can you wait that long? Hmmm.... maybe we could sneak a little peek. WHAT?! Did I say that? REALLY?! A sneak peek?!? This early?! We wouldn't! Well maybe.... just one little peek next week.... tune in daily to make sure you see it! A fun new game for you this week! 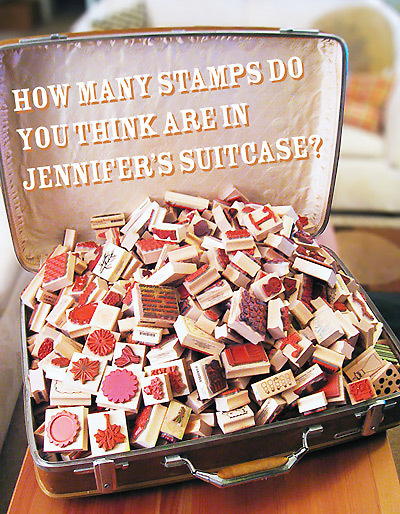 How many stamps do YOU think are in Jennifer's Suitcase? Click here to enter your guess! Make it a good guess because you only get one entry! The game ends at midnight Pacific time on Monday May 21st. 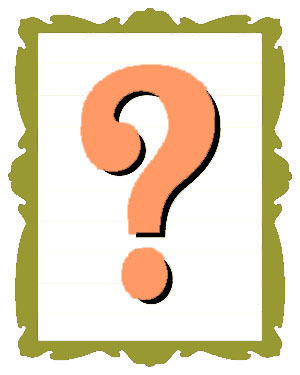 If you are the first person to guess the correct answer, you win a $100 gift certificate* to A Muse! If there is no winner, we will add this prize to our next silly A-MUSE-A-PALOOZA contest. While you're here, grab your stamps and participate in our design challenge below! Good luck! *Gift certificates may only be redeemed for A Muse products directly from A Muse. Edited to Add (5/21/07): If you are unable to access the voting link above, you may email your guess to us at amuseapalooza@comcast.net. Please include your first name, last name, email address, and guess. This week, your challenge is to use this card sketch for your designs! Click here to see the sketch and a sample by designer Jennifer Pebbles! You may use your choice of ink, papers, colors, stamps (please use at least one A Muse stamp if possible), embellishments, etc. Leave a comment on this post (one comment per card) and include a blog or gallery page link to a photo of your new original creation by end of day Sunday, May 20th. (Cards must be new creations not previously posted or submitted to any A Muse contest.) Then we'll draw a random winner on Monday! The challenge winner this week will receive a full year subscription to the Splitcoast Stampers Fan Club (aka "the Dirty Dozen" gallery) and an SCS Mug in the color of their choice! If the winner already has a subscription to the SCS Fan Club, their membership will be extended for one year FREE! Don't have a blog or online gallery? Leave a link to your card photo from your online photo album (such as Kodak EasyShare, Snapfish, Flickr, etc). Or see our links at the end of challenge 1 to setup a Splitcoaststampers gallery. Happy Stamping! 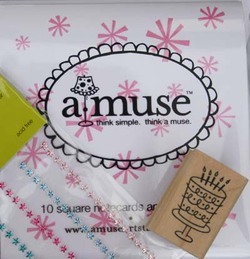 You won four packages of A Muse Twinkle Stickers: 1 micro dot, 1 mini dot, 1 mini star, and 1 mini heart! Sarah, send an email with your address to amuseapalooza@comcast.net and we'll send out your goodies! Challenge 3 is up next! Thank-you to everyone who participated in challenge 2! Make sure to check out all the great cards! Elena, please send an email to us at amuseapalooza@comast.net to confirm your address and we'll get your goodies in the mail to you! Stay tuned for Challenge 3! We know that many of our customers are mothers and grandmothers. We wish you all a very Happy Mother's Day today! Enjoy this special day. There is still plenty of time to participate in Challenge 2 - see Tuesday's post below for details! Our next featured store is The Inkspot in St.Louis, Missouri. 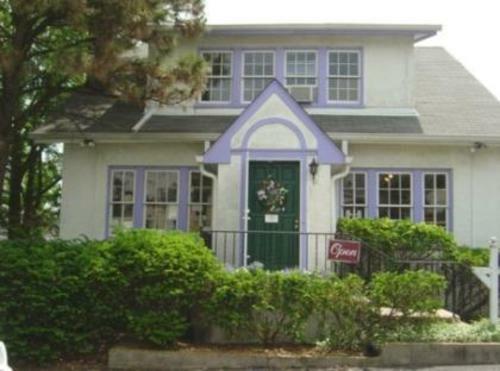 The Inkspot has been open since 1999 and is located in a precious cottage painted white with periwinkle trim. The owner, Julie Forb, adores the A Muse line and always has a huge display of A Muse Stamps in a prime position in the store. She received the very first ever A Muse catalog way back when. She handwrote on the front, "this company has potential!" The Inkspot always smells great, because they have the best scented candles burning! (You can hear people say "boy, it smells good in here" as soon as they walk through the front door!) You’ll always hear great music softly playing in the store from country, to smooth jazz, to classical and some "pop" in between! St. Louis Cardinals Baseball will sometimes take over the music. Julie won’t miss a pitch, unless she needs to help customers, of course! They have talented employees and instructors and love walking in that "back" door every day! 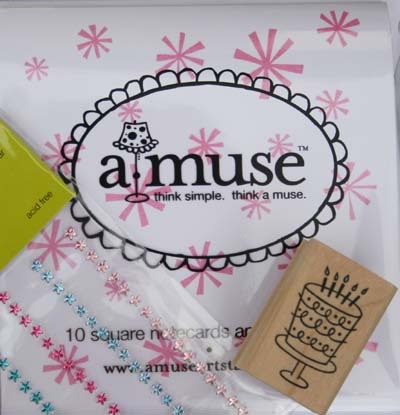 For the A-MUSE-A-PALOOZA event, they will be hosting a wine and cheese preview party and a birthday celebration with A Muse birthday stamps. 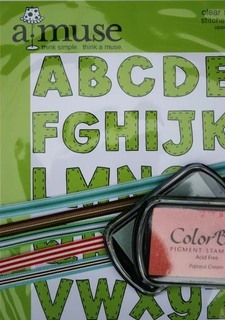 There will also be classes, make and takes and an art bar where you can play with A Muse stamps and products. Just a quick note for Ambassador Competition participants. We've sent two email messages to you from amuseapalooza@comcast.net. Did you get them? Please add our email address to your allowed list to ensure our messages aren't filtered as spam. Thanks! Put yourself on the A-MUSE-A-PALOOZA 2007 Frappr Map! If you are participating in our Ambassador Competition, we have two new ways for you to earn points! Make sure to check out Challenge 2 below! Challenge 2 - No Black Ink! Fun, fun, fun! Check out the post below to see the random winner picked today from the Ambassador Competition registrations! And now on to Challenge 2! 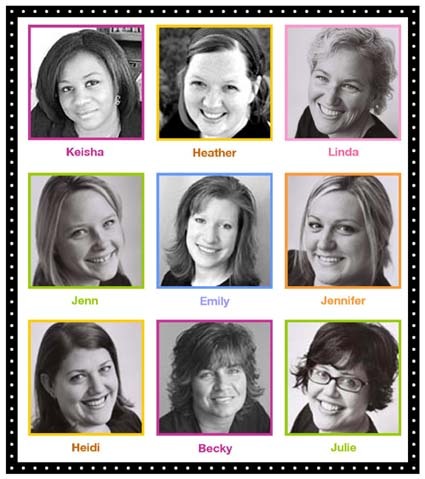 Click here to see a sample by designer Jenn Shurkus to get you thinking! Don't have a blog or online gallery? Leave a link to your card photo from your online photo album (such as Kodak EasyShare, Snapfish, Flickr, etc). Or see our links at the end of challenge 1 to setup a Splitcoaststampers gallery. Can't wait to see your creations! Geeta - send us an email at amuseapalooza@comcast.net to confirm your mailing address and we'll send your goodies in the mail to you! Thank-you to everyone who participated in our first challenge! Make sure to check out all the great cards linked in the comments of the challenge post! Send us an email to confirm your address and we'll get your goodies in the mail to you! Coming up this week for the next challenge - you can put away your black ink because you won't need it for this one! Stay tuned! There is still time to participate in our first challenge - see yesterday's post below for details! 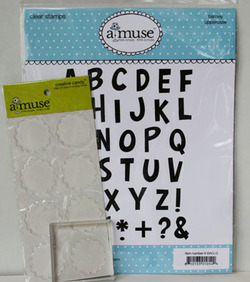 Each week we will be sharing a featured store as we count down to A-MUSE-A-PALOOZA! Our first featured store is Colorful Creations located in Hyannis, MA. We asked them to write a few things about their store to share with you! Colorful Creations is a paper crafters paradise that opened in 1999 to fill that creative spot in all our lives. In our new space we boast 3500 square feet of heaven. (10 feet of wall is *just* A Muse!!) Here you can shop, create, and chat! We hope Colorful Creations becomes your creative spot too! 1. We have 10 feet in A Muse product alone!! 5. We throw special events like we're rock stars! 9. We have plans for all SEVEN days of A*MUSE*A*PALOOZA!! 10. We want to meet other A Muse addicts, like us!! Make sure you say hello! Click here to see more photos of our store! Challenge 1 - Black ink only! Welcome to the first of our design challenges! 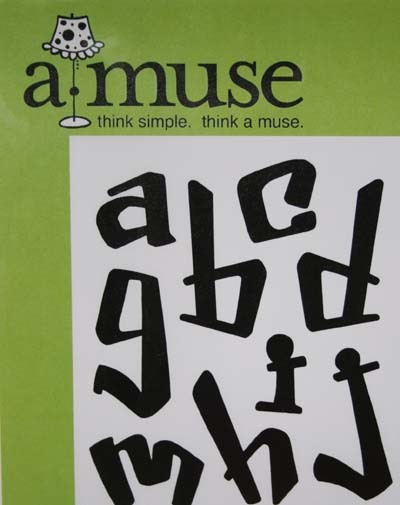 We will be hosting a design challenge each week as we count-down to A-MUSE-A-PALOOZA! So get ready to stamp because there will be PRIZES! At the end of each challenge, we'll draw a random winner from the entries on the challenge post for the week. So let's get started! Our first design challenge is to use black ink only - no colored ink! You may use your choice of papers, stamps (please use at least one A Muse stamp if possible), ribbon, embellishments, markers, pencils, etc. (It is OK to color in the images after you stamp them with black.) Leave a comment on this post and include a blog or gallery page link to a photo of your creation by end of day Sunday, May 6th. We'll draw a random winner on Monday who will receive everything pictured here: our new Barney clear alpha set, a 2.5" clear block, and a package of scallop circle clear stickers - a retail value of $38! ETA: You may submit more than one entry for this challenge! The more you create, the more chances you have to win! Click here to see a sample by designer Sarah Vrolyk to get you thinking! To register - it's free of course!